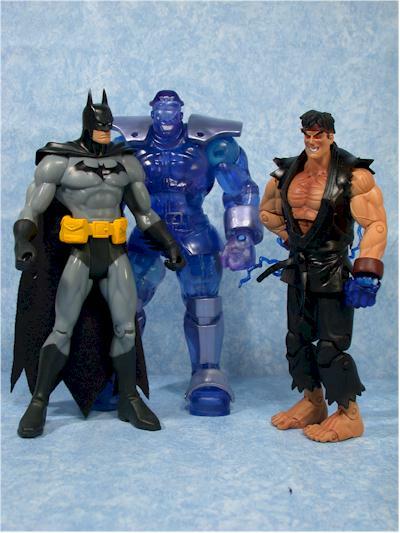 For several years, video games were THE source of action figure lines. Almost as popular as film licenses, it seemed that every game got the treatment. And some games got more than just the basic treatment - they got the facial, massage and mud bath as well. One such line is Street Fighter. Hasbro was really the first company to give the license a shot, way back in the early 90's. Their 3 3/4" figures were first part of the G.I. Joe line, then a line by themselves. They also did a line of the usual craptacular 12" figures. 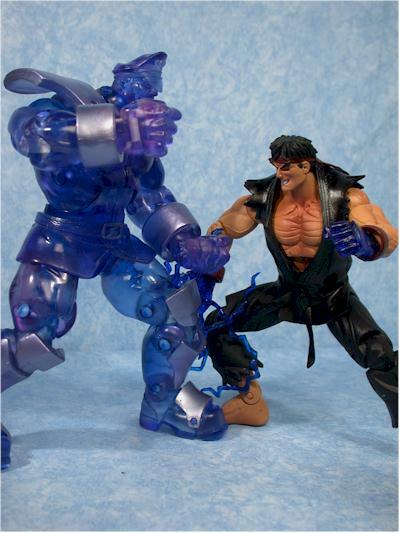 Toybiz took the next crack at it in the second half of the 90's, releasing a variety of two packs, some of them called X-men vs Street Fighter that pitted your favorite mutant against your favorite martial artist. Resaurus was the next company to give it a shot, starting in 1999. Now my memory might be a little fuzzy, but I believe they made it to the second series, but were cancelled before the third ever came out. Of course, not all of this had to do with the license itself, as Resaurus was having problems of it's own, and eventually folded. 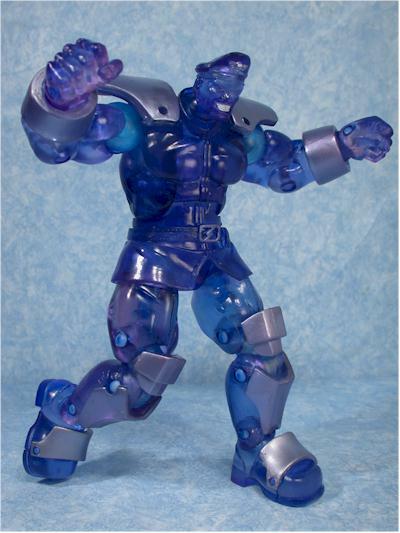 Palisades tried next in 2003, but those figures never made it past concept art. 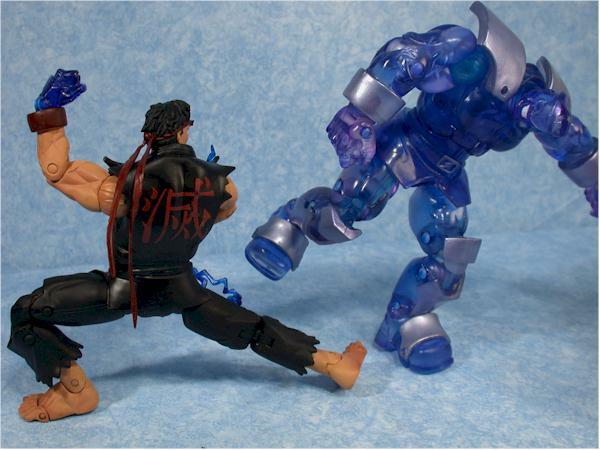 That same year, High Dreams announced that they'd be doing some figures as part of their Capcom vs. SNK2 license. I'm not sure what the current status is on these, but last I heard they were still in the pipeline. And now we have SOTA giving it the old college try. The first series will include Ryu, Sagat, Sodom, Chun Li, Bison and Evil Ryu. It's nice to see no one was bogarting this license. As an intro to the line, SOTA produced a special San Diego Comic Convention exclusive two pack. 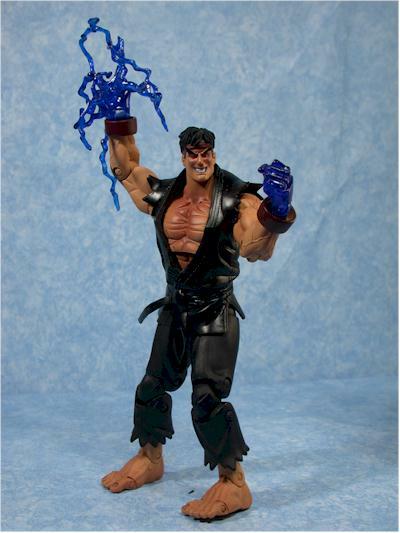 It contains a slightly different version of Evil Ryu (his fist is crackling with tendrils of energy in this version), and the Psycho version of M. Bison. It sold for $35 at the con, but you're best bet is now the secondary market. Or you could enter the August giveaway when I'll be giving this pair away for free! The packaging is attractive, but a tad oversized. It is a clamshell though, so it should hold up pretty well to shelf abuse. And I didn't include a photo because I ripped this guy open back in San Diego. I did take a 'hotel room' photo, but since I had enough loose pictures to make up the review, I figured I could skip it. Just this time. The sculpting on both of this figures is top notch, and matches the characters extremely well - at least as I remember them. Keep in mind I haven't played the game since the days when my ten year old son regularly pounded the crap out of me. He's 21 now. 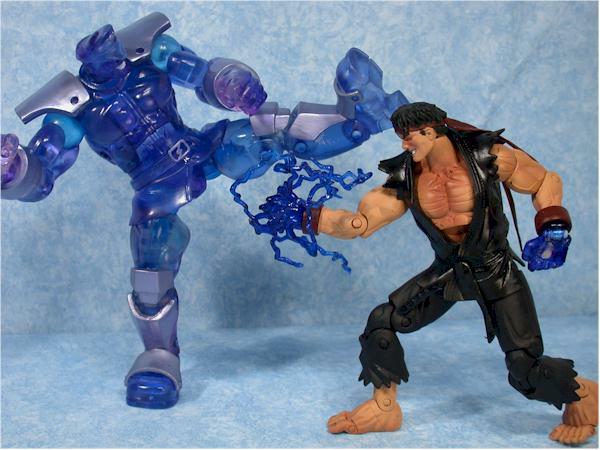 The detail work stands out best on Ryu, since Bison's clear blue appearance makes the detail a little less obvious. 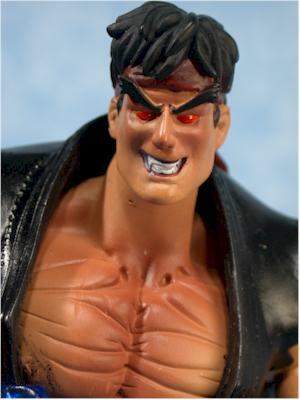 Ryu has his 'evil' expression, and the sculpt works extremely well with the high level of articulation. His right hand is sculpted with the blue tendrils attached, and you might have some trouble getting them in just the right spot without breaking them. A little hot water or a blow dryer might help, followed by some cold water. 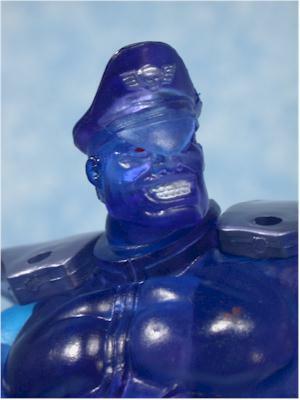 As I said, Bison' sculpt detail is less obvious, since there are so few paint ops to bring it out, but you can still tell that the normal version is going to look great. He's got some serious bulk, and looks great next to Ryu. Scale on this is good as well, and they should fit in nicely with other 6" - 7" lines like Marvel Legends or Mattel Batman. The paint ops aren't as nice as the sculpt, but they're certainly acceptable. That's not really fair for Bison though, since the only paint ops are the silver armor and the silver buckle and insignia. Otherwise, he's a clear blue, and that looks terrific. Since the larger armor pieces were probably painted before assembly, there's no slop between the silver and blue. There were a couple spots where the silver could have been a little more consistent, but it's a tough color to work with. 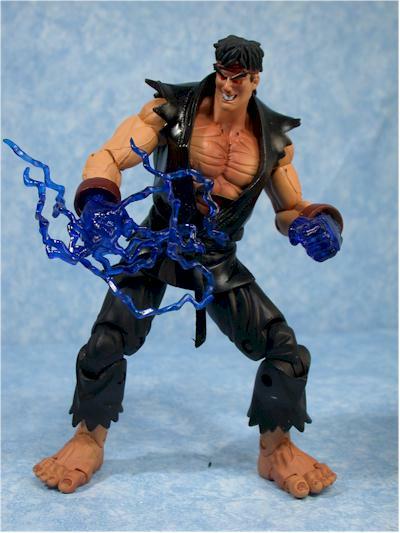 Ryu has a wash on his body to bring out the muscle definition, a dark uniform, and very red eyes. The quality of the work is similar to Marvel Legends, but not quite at the level of Mcfarlane stuff, for example. There's a little slop here and there, and some poor definition between colors. It's on par with most mass market lines. Articulation junkies should be happy! 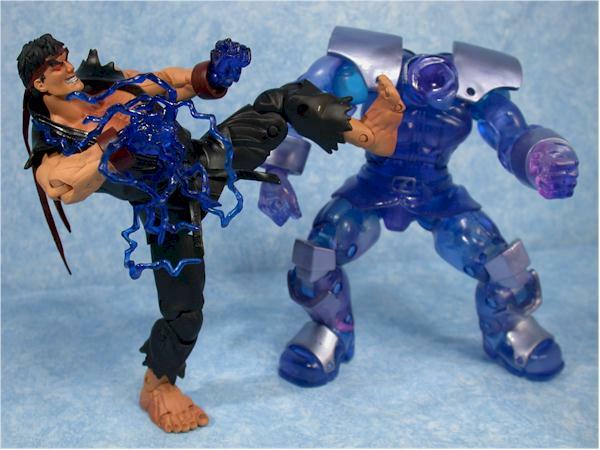 Both of these figures have a ton of joints, and can hold lots of fighting positions. The center of gravity on the figures works well with the positioning of the joints and legs - nice work on SOTA's part. Both have a ball jointed neck, ball jointed shoulders and hips, knees, wrists (pin joints, not cut joints, so the hands can also move backward and forward), double jointed knees, waist, chest, ankle and two foot joints. Bison's chest joint deserves special mention, as it allows him to lean way back, or curl forward. This allows you to have much more control over his center of gravity, making difficult poses much easier. The joints are nice and tight, and hold poses well. The level of articulation is very impressive, and almost all of it is extremely useful for posing. Ryu's shirt interferes a bit with the chest and waist, and Bison's armor is *slightly* restrictive, but in general you'll find these to be great for posing and play. This is the way these fighting figures should be - and how figures like Kill Bill or the Matrix should have been. This two pack is light on accessories. 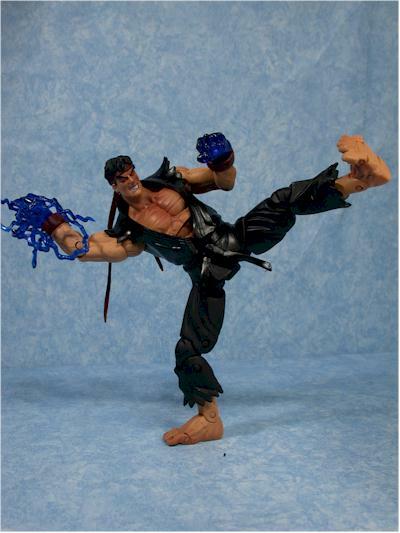 Ryu has nothing, although he has that spiffy looking right hand. 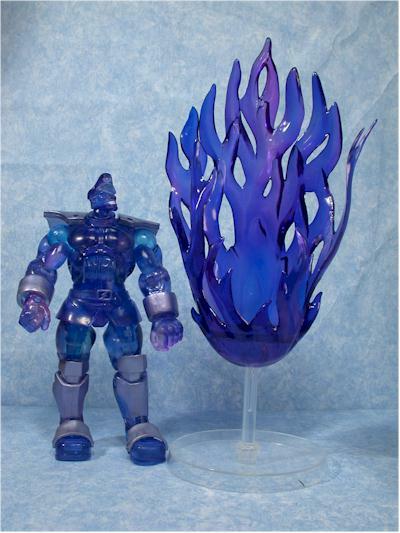 Mister Bison comes with his ball of blue flame, that he floats in when going psycho. It's supported on a clear plastic base to allow him to 'float', but he doesn't fit in it particularly well. He's too top heavy when inside the flames, and with his feet very close together, he wants to dive out. You can wrap his hands back around the flames to keep him in, but that really shouldn't be necessary. It was a cool idea that didn't quite pan out that well. If you have kids into this game, they'll love this line. The figures look terrific, and they'll be able to recreate their favorite battles. The only thing that would improve this score is additional accessories or perhaps dioramas based on the game locations. The usual con exclusive runs $15 to $20. This two pack costs $35, which is a tad steep, but not too extreme. At $30, I think folks would feel a lot more comfortable. Then again, consider the two packs from DC Direct that run $30 to $40 at retail, and you'll see that these aren't a whole lot different. I've heard some folks complaining about this line, but I have no idea what the problem could be. This particular set is a tad expensive, but the regular line will be more in line with what you'd expect. I mentioned this before, but wanted to reiterate it - none of the poses in any of the photos is using any sort of support to hold up the figures. The figures aren't leaning or even touching each other, and there's nothing else holding them up. 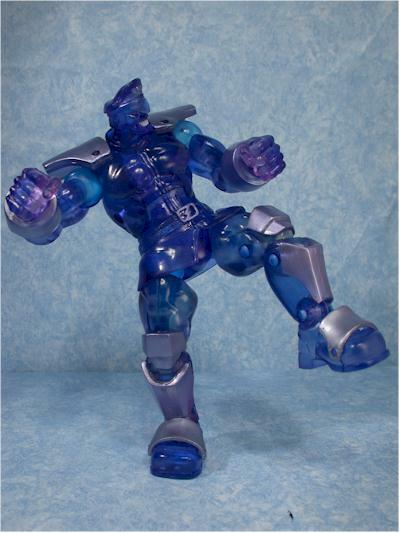 It's pretty rare than you can do that with figures, even with this much articulation. The sculpts are solid, the articulation excellent - these make great toys AND great collectible figures. You'll be able to pose them in all kinds of fighting stances, and in the photos on this page, they are all holding their own poses. They aren't leaning against each other or anything else, and they held these poses for long periods of time. Overall, this is a fun line, with lots of potential. The Con was the place to pick them up, but SOTA is coming through for the fans, at least for the moment. Hit their site and you can pick up any of the con exclusives for the original prices. That's just $35 for this two pack, but hurry, I don't expect them to last! - Krypton Collectibles has series 1 listed for just $10 each. - Southern Island has a great price - series 1 and 2 for $45 (five figures) or individually for $9 each. - CornerStoreComics has series 1 up for $55 or most of the figures for $12 individually. But they also have the variant Ryu and variant Chun Li listed at $15! - Alter Ego Comics has cases of series 2 up for $120 - that's 12 figures! - Killer Toys has series 1 listed at $55 for the set, or $12 each individually. Scroll down for more fighting photos!